I crisped the Lavash in the oven. Then I cooked a piece of chicken and cut it up. 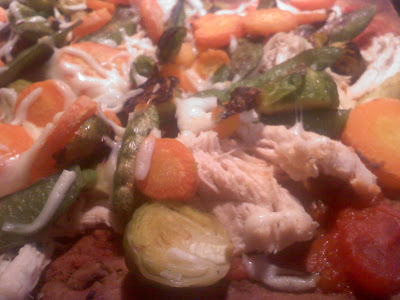 I roasted brussel sprouts, carrots, and sugar snap peas in olive oil in the oven until they were crispy and blackened. I added the chicken, veggies, sauce, and cheese to the Lavash and cooked it in the oven until the cheese was melted. A medium thin n crispy veggie pizza from Pizza Hut has 1440 calories. Yikes!